This tiny headset Earbud offers handsfree smartphone operation with noise cancelling microphone. Compatible with most mobile phones which are Bluetooth enabled including popular models like the iPhone 6, 6S, iPad, iPod, MacBook Air, Sumsung Galaxy range and the HTC One. This VicTsing headset unit is really convenient for driving and cycling, allowing you to keep both hands free while tasking calls and listening to your music library. The VicTsing Bluetooth Headset can connect to two devices at the same time and uses the latest Bluetooth 4.0 technology with a 10 metre connection range. It’s a comfortable headset too, designed into a shape which is inclined into your ear for a perfect fit. The headset has a high tech rechargeable Lithium Polymer Battery, which only takes 2 hours to fully charge up and provides up to 5 hours talk time and 80 hours on standby. The headset looks modern and fashionable, so tiny it is perfect for stealthily listening to music. There is also great echo and background noise cancellation, so you can have a conversation even outdoors in high winds without problems. The headset unit comes with three different sizes of eartips for different ears for complete comfort, plus the earhook keeps the headset stable even when moving around, so this headset is also pretty good for outdoor, sporty types. Those using Apple devices will be able to see battery power remaining on their devices, plus you also get voice reporting of incoming phone number and voice control of several functions including volume and skip. 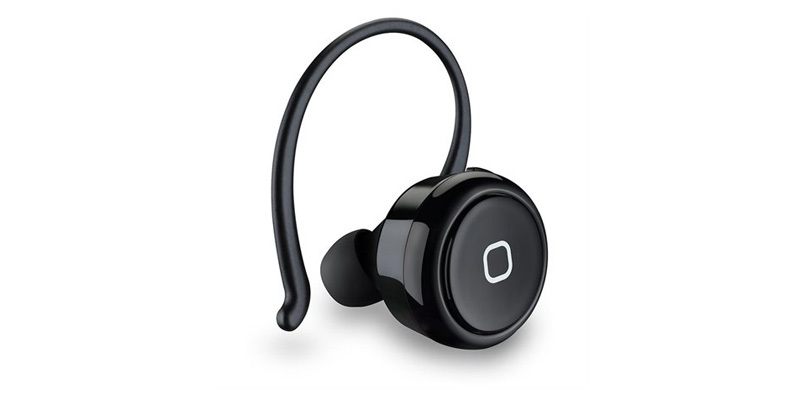 This tiny headset is comfortable and powerful, packing the latest Bluetooth 4.0 technology and useful voice controls, it’s a highly recommended buy for those looking for a discreet headset at a low price from around £12.99).